ROELAND PARK — Catholic schools and families shared a night devoted to inclusion at the inaugural EMBRACE Day resource fair for children with special needs. The event, held at Bishop Miege High School in Roeland Park on April 12, was hosted by Enriching Many By Reaching All in Catholic Education (EMBRACE), a nonprofit organization designed to assist students with special needs in Kansas Catholic schools. More than 80 people attended the event, which featured 34 vendors providing resources to children with special needs. Some of the vendors serve children of all abilities. Started in July 2017, EMBRACE works closely with the Catholic school office of the Archdiocese of Kansas City in Kansas. According to EMBRACE special projects coordinator Liz Obrecht, the organization supports a learning environment within Catholic schools that embraces all learners, values every child and sees God’s sacred holiness in every unique individual. “There are already a lot of wonderful things going on in our Catholic schools. We visited a majority of the Johnson and Wyandotte schools and want to enhance what’s going on,” Obrecht said. One such resource at the event was Emma’s Place for Exceptional Children, an Overland Park therapeutic day care serving children with special needs from kindergarten through 12th grade. Emma’s Place founder and former special education teacher Heather Barboza opened the center after assessing the need to extend a child’s learning when school is not in session, whether that’s after school, summers, snow days or teacher in-service days. “I began hearing from the families of my students about how difficult it was to find a day care for their children with special needs — a day care that was attuned to their needs for academic, social and independent living skills outside the school day,” Barboza said. “Our families want more than just a place in front of the TV when school is not in session,” she added. Emma’s Place differs from traditional day cares. Its multiple sensory rooms, movement studio with swings and music, calming rooms, reading nooks, homework bays and medical room for children with special medical needs offer families raising children with special needs more support. During the EMBRACE resource fair, Emma’s Place rolled out its summer program, which features a curriculum of experiential learning, such as field trips to the pool, the zoo, the Deanna Rose Farmstead and inclusive parks, as well as in-house programming such as dance instruction, arts and crafts, music therapy and more. In addition to showcasing vendors, the EMBRACE event recognized area Catholic schools by awarding grants to 10 different schools to assist them with the cost of supporting professionals providing speech, occupational therapy, enrichment, special education and other resources in the schools. The grants also can be used to purchase materials to provide appropriate accommodations and modifications to the curriculum. EMBRACE also supports a resource center with over 750 materials available for use and check-out by schools, teachers and parents. In all, the grants totaled $430,000 over a three-year period. 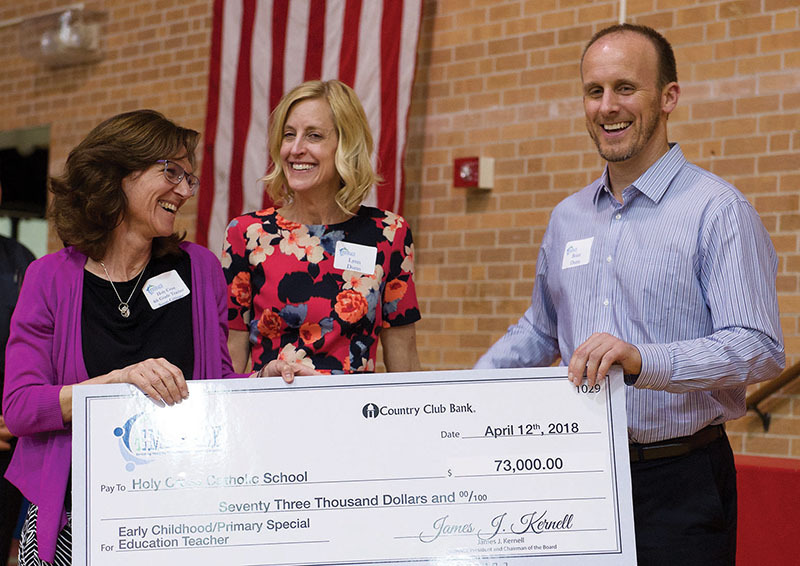 Schools receiving a grant included St. James Academy, Holy Cross, St. Agnes, Church of the Nativity, Church of the Ascension, St. Michael, St. Ann, Prince of Peace, John Paul II and Curé of Ars. Among the resources at EMBRACE Day was Perfect Wings, a program within the archdiocese designed to support students with special needs enrolled in Catholic schools. EMBRACE Day will take place annually around April 13, the feast day of Blessed Margaret of Castello, the guiding patron of EMBRACE. To learn more, visit the website.